I live in Bleasdale, near to Garstang, Preston. At the moment, I study A Level’s in Dance, English Literature, French and History at Runshaw College, Leyland and before that I went to St. Cecilia’s RC High School in Longridge. Please tell us a bit about what age you started dancing, why and where you were first taught? I started dancing when I was four years old, and attended The Garstang School of Dance. I did weekly classes in Tap, Ballet and Modern which were great fun and really encouraged my passion for dance and performing. Then, when I was 15, I auditioned for and joined Ludus Youth Dance Company in Lancaster and then Maelstrom Youth, which introduced me to contemporary dance. I continue to dance with both these companies as it gives me an invaluable experience of contemporary dance technique and performance. When did you apply for the National Youth Dance Company and why you wanted to be involved? 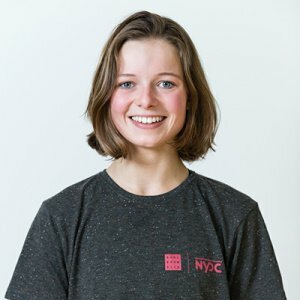 I applied for NYDC at UDance Nationals 2016, where I did an experience workshop. I honestly didn’t imagine that I would be asked to attend the final audition, let alone be invited to join the company. I knew that NYDC was the flagship youth dance company for England, but not much more than that, so my main reason for attending the initial workshop was for the chance to dance more! Going to Sadler’s Wells for the final audition was nerve-wracking, but I approached it as another fantastic dance experience under international dance professionals. How did it feel to be selected? I was absolutely speechless! After the initial surprise, I was ecstatic and very proud of myself, along with being nervous to see what the year would have in store. How have you found the experience so far and what are you most looking forward to? NYDC has been an amazing experience so far. It’s difficult to describe, but the intensity of the days, the quality of the dance and the wonderful people in the company all mean that I didn’t want to come home after the October and February residencies! Really, I love it all, so I’m looking forward to everything: the next residency, the Premiere and the tour of the UK in the summer. At the moment, I’m particularly excited to be performing at Latitude Festival 2017 and hoping we will get the chance to watch some of the other performances there. Tell me a bit about the show – what can we expect? What new skills have you learnt? Tarantiseismic is going to be a very powerful performance, especially as the company is so big, with lots of dancers. Damien has been exploring abandonment, ritual, control, and melancholia with us. I think it will be exhausting to dance, and amazing to watch! Particularly, we have worked on finding opposition, release and control in our movements, whilst also improving fitness and stamina along the way. What are you hoping to gain from the experience? NYDC has already increased my confidence a lot in dance, and as the year progresses, it is my aim to continue to push myself out of my comfort zone. NYDC is also a wonderful opportunity to work closely in a professional environment with an international choreographer, and to experience growing from a group of young dancers into a cohesive Company, skills which I know will be useful throughout my life, not just in dance. What has it been like to work with Damien Jalet? It has been an incredible experience working with Damien Jalet- he is an internationally-renowned choreographer and he pushes us to achieve things I didn’t think were possible. Damien makes us work very hard, and although each day is as exhausting as the last, it is also very rewarding. He is so focussed and has such a clear idea of what he wants to achieve that it inspires all of us. Having watched various of Damien’s previous works, it is a very exciting feeling to hope that he will create something just as spectacular with us.